One of my favorite dishes my mom makes is called Chicken Miyabi. Whenever I go back home, my friends all seem to become available for dinner so my mother can feed us all this delicious chicken. It is a win win for everyone since my mom loves to feed people and my friends only get to eat this specialty when I am in town. My mom originally learned how to make this dish from my Auntie Joyce in Hawaii, where my mom was born and raised. I will post the steps below as well as photos, but am sadly not going to post the recipe. It is a family recipe and one that I prefer to keep secret and special. You start with fresh chicken breasts, cut into two inch cubes and lightly dredge them in flour. In the meantime, you prepare the sauce in which the chicken will take a short bath. It is a teriyaki sweet ginger sauce that simmers over low heat until ready for dipping. You will also need to prepare the oil for frying the chicken. We use two pans full of canola or vegetable oil at the right high heat. We lower about eight pieces of chicken in each pan and fry until they turn golden brown, while rotating them to ensure even cooking. Once the chicken is cooked through and the perfect golden brown color, my mom and I pull them out using tongs and soak them in the teriyaki sauce. The sauce is so deliciously absorbed into the crisp exterior flavoring the chicken in the perfect sweet sauce. We then place the chicken on paper towel lined plates to absorb the excess oil and keep the chicken crisp. We eat the chicken with white sticky rice and the combination is so good. It is not a seven course meal that is fancy, but rather the tastiest homemade meal of two things that will keep your taste buds craving more for weeks to come. I was just home for the holidays and got to make this chicken with my mom and made great memories. It was as amazing as always and I promised to make it out here in LA so the people I care about most can try it. I love salt and vinegar chips, which actually was an acquired taste over the years as the flavor is quite bold. I find myself craving the tangy zing that these potato crisps pack with a punch in every bag. We decided to have a taste test to decide which brand would win. I did the test blind so I wouldn’t be swayed by brand preference. Three white bowls were filled with the different brands and I tried one at a time and over and over again to choose my favorite. The unscientific results are below. The Cape Cod chips were lightly fried with an even distribution of salt and vinegar which tickled my tongue with each and every bite. These chips are perfect for summer. The Kettle Brand Krinkle cut chips were very intriguing as they had ruffles which made for great texture that added to the light and airy crunch of each bite. Tim’s chips were the most satisfying in regard to the crunch factor. They were the thickest of the three and the boldest in flavor, which was applied with a bit of a heavy hand that made our tastebuds jump. The heaviness of these make them better suited for fall. The solid winner was Cape Cod. It was the perfect balance of flavor to crunch and would pair beautifully with most sandwiches without over powering it. This was a fun little taste test experiment and I sipped the Fever-Tree ginger beer in between bites to cleanse my palate and it worked so well together. Ok, ok, the ginger beer was also spiked with Vodka, which made the test even more exciting. Choose your three favorite brands and conduct an experiment of your own for a fun night in. The Midi ring is the ring that is worn on your finger in between your knuckle and your nail. It is an edgy, yet feminine way to wear a delicate ring. Many of my friends are rocking this look and every time I have dinner with them I promptly ask them to remove their jewels so I can try them on. So very child like dress up in mommy’s closet, but with my friends gold trinkets instead. These girls are so very cool and always dress on point, so I love to try different trends through them and seek styling inspiration. My favorites that they own are from 14 Karat in Beverly Hills, EF Collection, and Jacquie Aiche. The rings are in gold and rose gold mostly and are always thin and some are embellished with diamonds. I love the chevron rings the most and you know how much I am obsessed with rose gold. The tone is just so flattering on everyone’s skin tone, you can’t go wrong. These rings are usually not super expensive, but can get up to $1000. I am always surprised to find out that many of them are $250 and under. The perfect price point for a birthday or holiday gift for a friend or loved one. I still do not own a midi ring, but will soon enough and will keep you posted on which one I go with. I have posted several pictures of the styles I like the most below from Jacquie Aiche. We all remember the moment when Andy gets her much needed makeover in The Devil Wears Prada movie. Anne Hathaway’s character Andy starts out as a frumpy journalist wearing three seasons old cerulean blue sweaters and, GASP, clogs. As the movie progresses and she has her light blub moment, or as Oprah would say, her Ah Hah, moment, she makes a visit to the coveted closet of Runway Magazine. The closet is every girls dream filled with designer clothing, shoes, handbags, jewels and makeup. She is handed countless items without a bat of an eye, thousands of dollars and hopes and dreams of women everywhere just given to her as she is in such desperate need. Hours later she returns to her desk and the First Assistant, Emily, is shocked into silence, as is Gilsele Bunchen’s character, at her appearance. She looks chic, timeless, fantastically fashionable, and best of all, confident. She is wearing the thigh high Chanel boots. From the moment I saw them on the screen, I lusted over them. The way they perfectly fit and made her outfit edgy, but classy all at the same time. I’m sure you all felt the same. The transformation was breath taking and made us all wish we were her. Well, most of us can’t have the boots, but we can watch the movie and lust after all the beautiful ensembles featured in the show. So, break out the pink champagne, invite a few girlfriends over and agree to freeze frame the parts of the movie that feature your fashion favorites, and then watch it all over again. Fever-Tree has created the perfect mixer for a light and refreshing cocktail. Their Ginger Beer is non-alcoholic and has a wonderfully crisp flavor of fresh ginger root to awaken your taste buds and refresh your palate. The company brews three types of ginger originating from Nigeria, Cochin and the Ivory Coast that blend beautifully together with champagne-style carbonation to create their award-winning flavor and effervescence. The light bubbles and flavor are the perfect pairing for a Moscow Mule, Dark and Stormy, or simple cocktail of your choice. You can enjoy the beverage on its own as well. The ginger will even help settle your stomach if you indulged in one too many holiday treats at the party. Do not let the title of “beer” mislead you, but rather give it a try and you will be as pleasantly surprised as I was. Normally I would not be into a beer beverage, but this one is alcohol free and I have learned to not judge a book by its cover and in this case that adage has rung true. Pick some up at Sur la Table for your holiday parties or just to keep on hand. A case of four retails for $8. Visit http://www.fever-tree.com for more information on the product. A friend of mine posted a picture of these little vegan gems she was making for her daughter’s school. She eats really clean and has a fabulous yoga body so I decided to whip them up and see if I liked them. As you all know, I love to bake and prefer to use full fat, from scratch recipes, but every so often I come across a great healthy alternative. This is exactly that kind of healthy treat that is tasty and totally guilt free. The recipe only has four ingredients and I super easy to make. You will need two ripe bananas, dash of cinnamon, 1/4 cup dark chocolate chips, 1 1/4 cup oats (I used gluten free). Mash the bananas in a bowl until they are completely blended. Add the oats, cinnamon, and chocolate chips until mixed well. Take a small ice cream scoop or two spoons and scoop out the batter onto a greased cookie sheet. I used coconut oil spray to grease it. Bake at 350 degrees for 20 mins and allow to completely cool. They are sweet and slightly crunchy on top. Perfect for a snack or even breakfast. The recipe makes 12 bite size morsels, so if you need more feel free to double the recipe. I professed my my love for the french dipped sandwich and was recently surprised and taken to Philippe. This restaurant is located in downtown LA and is a little slice of history. Philippe’s was established in 1908 and the owner accidentally created the french dipped sandwich. He was making a sandwich for a police officer and dropped the french roll in the roasting pan filled with the hot juices from roasting the meat. The officer decided he wanted the sandwich anyway and loved it so much he returned the next day and asked for the sandwich to be dipped in the drippings again. Thus the french dipped sandwich was born. The eatery is full of old school charm and comfort food. There is a large deli case filled with macaroni salad, pickles, potato salad, tapioca pudding, pies and more. The menu is hung behind the counter and features choices of meats for your sandwich, beverages, and prices of things. There are several lines that form to ensure everyone gets helped and the wait staff is dressed in old fashioned uniforms. Pay phones line one wall, a vintage candy case near the exit, saw dust lines the floor, and the tables offer family style seating, first come, first serve. 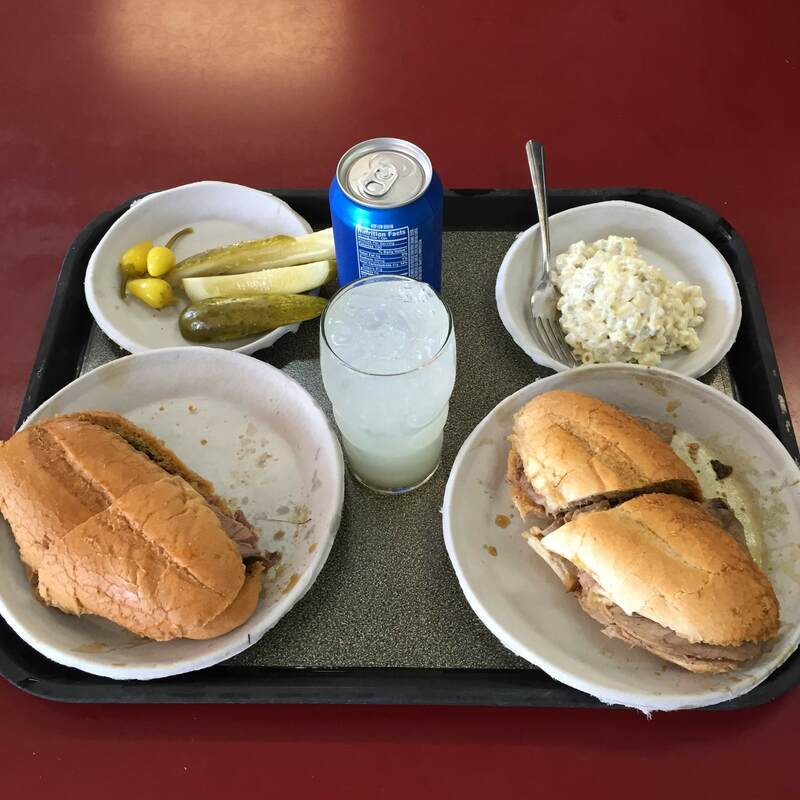 The food is served on paper plates and sodas sipped right out of the can, reminiscent of your cafeteria school days. Once we found our seat at a table, we armed ourselves with plenty of napkins in preparation of the au jus happily running down our mouths. I ordered the beef sandwich, double dipped because the saucier, the better for me. The first bite was amazing. The soft french roll was expertly filled with lace-like sliced roast beef tenderly cooked to perfection. The au jus coated both sides of the bun and delightfully drizzled down my lips and hands with every delectable bite. This is a sandwich done right and is the best french dip I have ever had. It was great with a side of macaroni salad, which perfectly complimented the sandwich. A soda to wash it down and that was lunch. I love finding gems like this in the city and this particular restaurant reminded me of my roots in Nebraska. Simple, delicious, and an “if it ain’t broke, don’t fit it,” kind of joint. I encourage you to try this sandwich and I promise if you get it dipped twice, it will be more than nice.